But let’s first start with the rules. When you approach the roulette table, you will first need to purchase “chips” from the dealer. Note that the chips you receive have no denomination, and are worthless outside of the roulette table. Also note that when someone refers to “casino chips” they are technically talking about roulette tokens. The other tokens you see throughout the casino are technically called checks or cheques. Each player at the table has his or her own color of chips. Once the dealer pays off all winning wagers from the previous spin of the wheel, it is time to place your chips on the table and guess where the ball will land on the wheel. There are several options to bet. See the image below for those options and payout. Note that this is the “American Roulette” table, which is the most prevalent table in America, with some exceptions (which will be explained in a bit). The house edge for every bet on the American Roulette table is 5.26%. The only exception is the Basket Bet (See bet “E” on the table), which includes the first three numbers as well as the 0 and 00. The house edge is 7.89% on the Basket Bet, and it should be avoided. Otherwise, go to town on the other bets because the house edge is exactly the same whether you bet a single 13 or ODD (but note the difference in payouts). 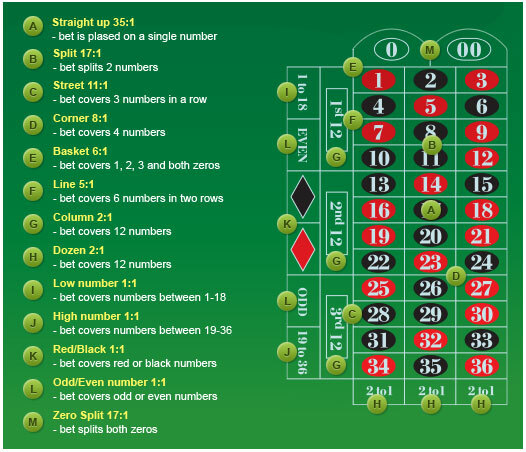 If you’re lucky, perhaps you will come across a “European Roulette” table. It will be very easy to know the difference between an American Roulette table and European Roulette table because the European table only has one single 0 instead of two (0 and 00). This lowers the house edge to 2.70%. There are not very many European tables easily accessible in Vegas, but they can be found in high limit rooms at some of the Strip’s biggest properties, including the Mirage, MGM Grand, Wynn, and Venetian. Note that the hours these tables are open vary from day to day and casino to casino (but be on the lookout, because these things change often). If you win, don’t touch your winnings until the dealer removes the dolly from the winning number. Don’t be afraid to ask the dealer to place the bet for you if you can’t reach it. Also feel free to put your chips on top of other chips. It will all get sorted out once the ball lands. Once the dealer waives “no more bets” don’t be the guy that tries to throw another bet down. There is no such thing as a winning betting system in roulette. Similarly, there’s really no such thing as optimal strategy considering the house edge is similar for nearly all bets on the table. There is a reason this is the easiest game in the casino to play. Avoid it unless you’re looking for entertainment and aren’t concerned with profitability. That said, it is a really fun game.